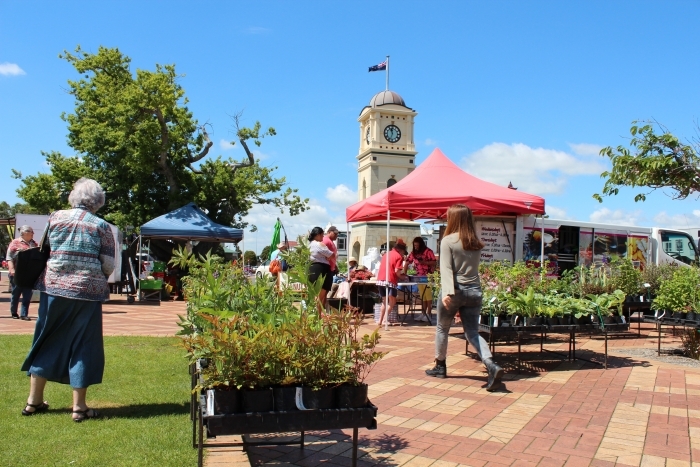 Feilding’s award winning Farmers’ Market attracts visitors into our CBD every Friday from 9 until 1:30, come rain, hail or shine. The bustling, happy chaos of our Farmers' Market is your chance to discover seasonal artisan delicacies and to meet the locals. Picturesque Manchester Square is the perfect setting and a great location in our town centre for producers to sell their honest-to-goodness, down to earth, farm fresh, home grown hand-made and cottage industry produce. Ours is an authentic Farmers' Market selling locally grown fresh produce and added value products. The Farmers’ Market meets a demand for the rising popularity by many to eat healthier and know where their food is coming from. Connecting with the producers on a more intimate level has developed a lively market culture that champions farmer and producer relationships. Friendly Feilding really comes alive on a Friday with livestock sales coinciding with the largest stock Sales Yards in the Southern Hemisphere. With free parking and no traffic lights the market is easy to get around and offers a unique shopping experience. Experience Feildings’ Friday Farmers’ Market for salt of the earth, honest-to-goodness freshness in New Zealand’s most beautiful town.